Discover the charm and culinary delights of one of the most celebrated food destinations in the United States. Asheville Food Tours is a great way for local residents and visitors to learn more about the city of Asheville while also discovering a number of its hidden culinary gems. From craft beers to hearty meals made from local sustainable ingredients, Asheville Food Tours invites people to walk their way through the delectable culinary offerings of the many restaurants and local eateries in Asheville. · The Downtown Tour - With this particular tour, individuals will get the opportunity to explore six or seven restaurants or eateries in the downtown Asheville area. Tour participants will discover that much of Asheville’s dedication to its local economy is what keeps this foodie town prosperous. 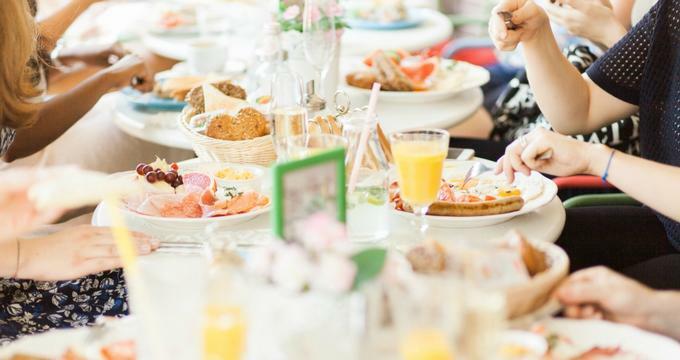 · Brunch Tour - This is a Saturday tour that includes four restaurant stops as well as two sweet stops in the downtown Asheville area for brunch. · Food Fan Foot Tour with Stu Helm - Well-known local food writer Stu Helm leads the way with this Sunday tour that offers both local residents and visitors a new perspective on the Asheville culinary scene. Tour participants will get to experience the culinary offerings of some of the best restaurants and eateries in the Asheville area while getting the guidance and opinions of an experienced local food writer. · All tours are 3½ hours long. · All tours occur rain or shine. · The Asheville Food Tours Passport allows tour participants to obtain discounts on return shopping and dining. · Wear comfortable clothing and shoes to maximize the enjoyment of the walking tour. · Tours scheduled between December and March that do not meet a minimum of 5 reservations will be cancelled and all funds will be refunded. · The meeting place for all of the Asheville Food Tours is in the Aloft Hotel at the WXYZ Bar, located at 51 Biltmore Avenue, Asheville, NC 28801. Tickets for the Asheville Food Tours can be purchased online. Once purchased, all tickets are non-refundable. Ticket dates can be changed within one year of the original tour date if tour purchasers are not able to commit to the original date. Asheville Food Tours offers private tours for parties of six or more people all year round. For more information on private tours, call (828) 243-7401 for availability. Gift certificates are also available for purchase online by choosing a specific food tour as a gift or entering a monetary amount for the gift certificate. Gift certificates will be delivered electronically to the recipient. Parking Paid parking is available at the parking garage connected to the Aloft Hotel. Free parking is available on Sundays at metered locations.